There isn’t just aesthetic but also deep sacred meaning – reflection of culture, beliefs and mindset of the Hindu, national heritage and reflection of souls of people. And history of creation of embellishment items is one of the most ancient histories in this world. First adornments were created in India as far back as during times of the Indus Valley Civilization and that is over 5 millenniums ago. Currently Hindu adornments are popular around the globe – they can complement black-tie, casual and boho styles but they always add unusual unique color to a look by eternally caring iconic Hindu charm. In the meantime, we unconsciously decorate as nearly as every part of our bodies following the suit of Hindu women without knowing that thus we are able to make our vibes more powerful or even change our lives. In India gold and silver are materials of choice for creation of adornments. Each pattern has connection to vegetation, especially flowers. This bonds a woman with nature, with growth, with nutrition and, consequently with providing future generations. Another distinctive feature of Hindu adornments is strict symmetry. Process of dress-up of a woman is a special everyday ritual that each Hindu woman is obliged to perform right after sleep. And scrutinous body decoration is her sacred duty. All chakras, organs of senses and actions have to be decorated. The ritual begins with a symbolic lavation. The following elements are included into a traditional Shringar set, without which a woman can be considered neither beautful nor attractive. Decoration of hair – Keshapasharachana. It implies a hairdo in the shape of a braid with flowers. Hair accessories are connected to Sahasrara – top chakra that is located on the crown. For women it is considered to be eternal youth chakra. Brides decorate it with Shringar Patti. Married women – with a pendant on a chain that is called Teeka. Also, for married woman it can be Sindoor – decoration of hair parting with bright-red powder. These adornments symbolize confluence of male and female principles that present a woman as the one keeping sacraments of marriage and giving new life to the family. Decoration of a spot on the forehead – Bindi. Ajna chakra is located there – the very spot that symbolizes the third eye; its decoration helps activate divine feminine knowledge, wisdom and elevated intuition. This is the main distinction of a married woman. Lips decoration – self-made lipstick is applied, made of a mixture of aroma oils and natural dyes. Peculiar tongue decoration is executed through chewing Paan that gives it a bright red color. Adornment for nose – Nath. In early age girls have their nose pierced on the left side – that’s women’s side. Piercing point is responsible for humility. To decorate it they use all kinds of earrings – rings and studs that can be accessorized with chains and are affixed to hair behind ear. Ear lobes decoration. Karn Phool are massive earrings in the shape of a flower or a branch with fruits. They bring consolation in pain and suffering. The bigger the earrings are, the higher spiritual powers a woman has, the more divine consolation she gets. Therefore among Hindu women earrings so heavy are spread that they need to be additionally affixed with chains. Neck decoration is called Haar. It can be all kinds of bead strings or necklaces, normally they are pretty massive and long in order to touch a couple chakras at once – Vishuddha and Anahata. It is believed that they emphasize mystic centers to attract love and protect it from jinx and envy. Mehndi – designs on body done with henna. It is used to decorate hands and feet in order to propitiate Ganesha god who bears down obstacles on the way of love. In marriage Mehndi means the power of love: the brighter the pattern, the stronger feelings are. Decoration of fingers. On all the fingers numerous rings and/or adornment of 8 chains that are bound with rings and bracelets are worn. Specifically adornment of thumb – Arsi – is distinguished. It is a peculiar ring with a mirror. Fables read that right after waking up woman has to see her face – that’s the function this ring performs. It protects beauty and emotional state of a woman. Thumb is chosen because it is considered the king of the palm. Waist decoration. Manipura chakra is located in the region of solar plexus – it is the chakra of stamina. To enhance it Kamarband is worn over sari – a band for either waist or thights, embellished with various precious stones. 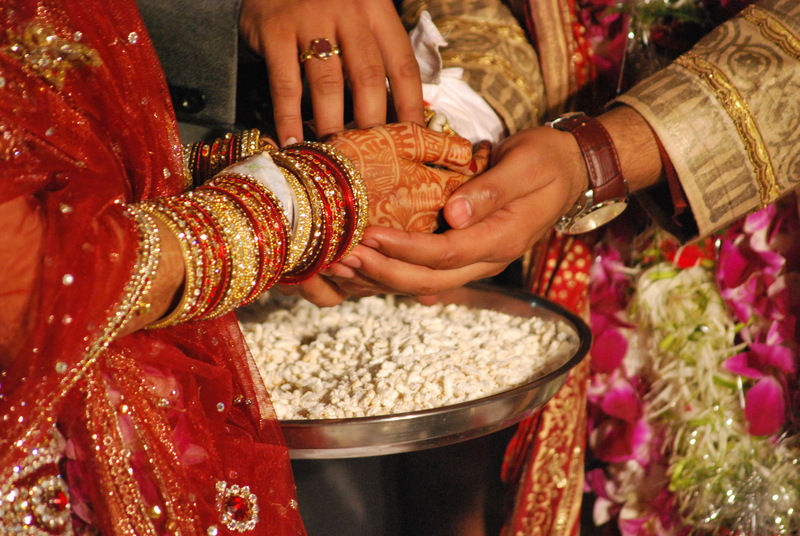 Upon marriage keys are put on it to symbolize handing over of household from a mother-in-law to a bride. Anklets. These may by thin chains or heavy thick bracelets, sometimes jingles are attached to them. Bells are supposed to attract attention of men – their sound is like a song to a man’s ear. In ancient times girls were even taught a special gait for those bells to have a harmonious melodic sound. Toes adornments are various rings worn in pairs.